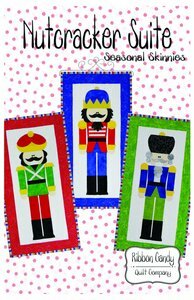 Let us dance along with these Nutcrackers! A holiday favorite, the Nutcracker stands guard over Christmas dreams. Use this pattern to add unique charm to your season. Perfect size to fit just about anywhere, each quilt finishes at 14" x 28". All three images in one pattern. All templates are full size. Fusible web applique is used for a fast and easy project for quilters of all levels.